LG has finally announced the LG G2's release date outside of South Korea, and as we expected it's right around the corner. The G2 will arrive in the U.S. and Germany this month before continuing on to the rest of the world, the phone maker revealed today. "The positive market feedback after the initial launch in Korea proved to us that the LG G2's consumer-oriented innovation does resonate with customers," LG President and CEO Dr. Jong-seok Park said in the announcement. "The LG G2 was developed as a global device for a global audience, beyond the scope of any smartphone we've introduced to date. I'm confident consumers will see the difference." 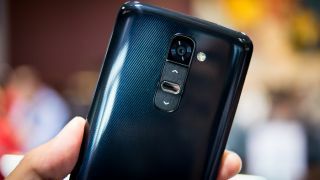 Formerly known as the Optimus G2, the G2 is LG's hope for a comeback in the world of mobile phones. Ultimately the G2 is expected to arrive on over 130 carriers globally. Its most notable feature is what LG calls the "rear key," a back-mounted button set that turns the device on and off and controls volume levels. LG says the rear key is supposed to be "intuitive and highly functional," though TechRadar wasn't convinced when the phone was unveiled. Besides that, we're looking at a 2.26 GHz quad-core Snapdragon 800 chip, 5.2-inch 1080p IPS display, 2GB RAM, 32GB storage, 13- and 2.1-megapixel cameras (the rear with Optical Image Stabilization), a 3000mAh battery and Android 4.2.2 Jelly Bean. We'll keep an ear out for specific launch dates, plus when it can be expected in other markets. The LG G2's specs are impressive, but is it really missing a soul?